CHIR99021 is an aminopyrimidine derivative that inhibits GSK3α and GSK3β with IC50 values of 10 and 6.7 nM, respectively. CP21R7 is a potent and selective GSK-3β inhibitor. Bikinin is a potent inhibitor of plant GSK-3/Shaggy-like kinase; activates BR signaling downstream of the BR receptor. IM-12 is a cell-permeable indolylmaleimide that acts as a Glycogen synthase kinase 3β (GSK-3β) inhibitor, activating downstream components of canonical Wnt signaling. 1-Azakenpaullone is a potent and selective GSK-3β inhibitor with IC50 of 18 nM, >100-fold selectivity over CDK1/cyclin B and CDK5/p25. AR-A 014418 is a selective glycogen synthase kinase 3 (GSK-3) inhibitor (IC50 = 104 nM). Exhibits specificity for GSK-3 over cdk2 and cdk5 (IC50 values are > 100 μM) and over 26 other kinases. Inhibits β-amyloid-mediated neurodegeneration in hippocampal slices. AZD2858 is a selective GSK-3 inhibitor with an IC50 of 68 nM, activating Wnt signaling, increases bone mass in rats. AZD1080 is a novel GSK3 inhibitor, rescues synaptic plasticity deficits in rodent brain and exhibits peripheral target engagement in humans. 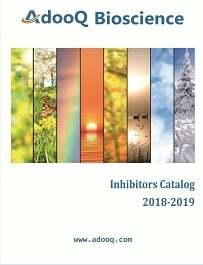 LY2090314 is a potent inhibitor of glycogen synthase kinase-3 (GSK-3) which plays an important role in many pathways, including initiation of protein synthesis, cell proliferation, cell differentiation, and apoptosis. TWS119 is a 4,6 disubstituted pyrrolopyrimidine that potently inhibits GSK3β with an IC50 value of 30 nM.1 At 400 nM. CHIR-98014 is a very potent, selective, cell-permeable reversible inhibitor of GSK-3. SB 415286 is a potent and selective cell-permeable, ATP-competitive inhibitor of GSK3α with an IC50 value of 78 nM (similar potency for GSK3β) and a Ki value of 31 nM. SB 216763 is a potent and selective cell permeable ATP-competitive inhibitor of GSK3α with an IC50 value of 34 nM (similar potency for GSK3β). Indirubin, the active constituent of a Chinese antileukaemia medicine, is a potent cyclin-dependent kinases and GSK-3β inhibitor with IC50 of about 5 μM and 0.6 μM. Indirubin-3'-monoxime is a powerful inhibitor of GSK-3β with IC50 of 22nM, also inhibits CDK1/5 (IC50 = 180/100 nM).